A credit card happens to be a matter of grave importance. When you apply at your bank for a credit card, it will have to be authorised by the manager at the bank. To get your credit card authorised and approved by the bank, you will have to fill out a specialised form for that. Now the Authorization Forms that you see in this section might come to your aid in this case. There are a large number of forms to choose from as well. 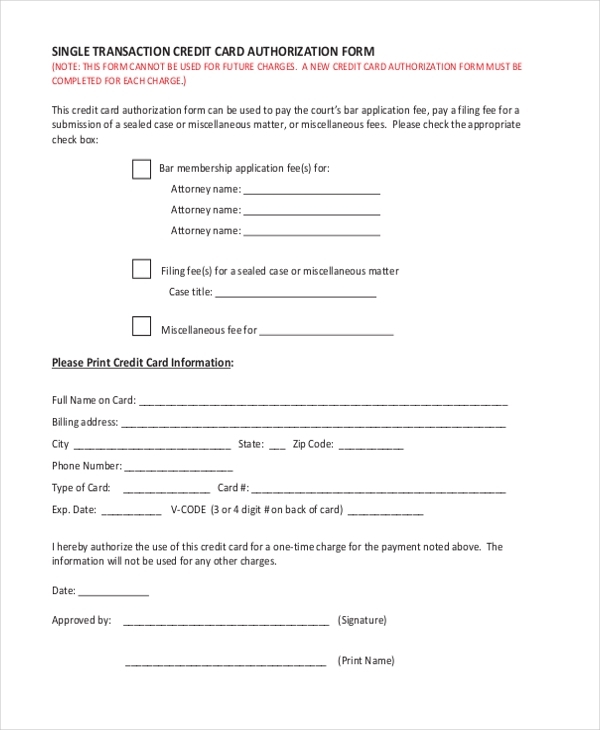 This credit card authorization form has been dedicated purely for payment purposes. As you can see the form template as it comes with a rather formal tone which is only right considering the situation. 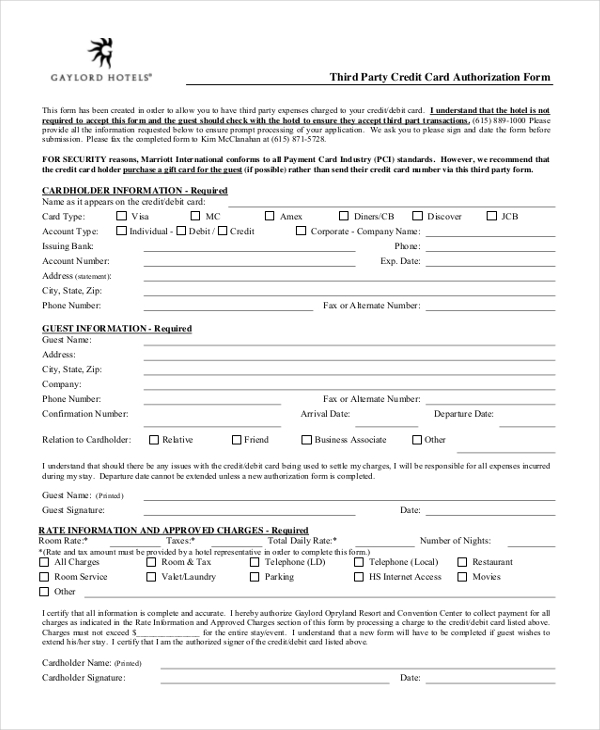 In order to get your authorization for a recurring credit card, you can take the help of this form template here. It comes in a neat and well-designed pdf format which you’ll find easy to use. 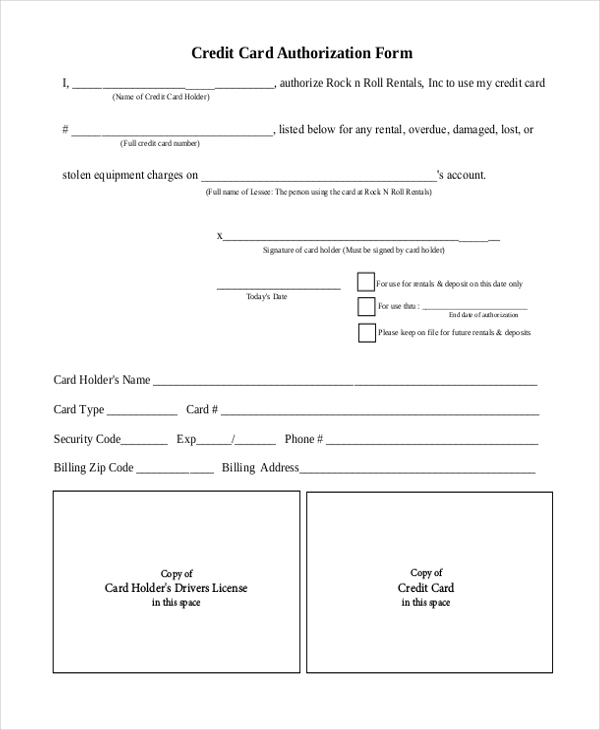 This credit card authorization form is mainly dedicated to those dealing with customer care. The tone of the document as well as the contents of the form are absolutely spot on. When it comes to credit card authorization forms, it is always advisable to go for blank forms. That way, you get to organise your information and data in any way you like. While using your credit card, you must have come across the term “self-certification”. The next time you need to get it done, you can simply take the help of this form template. 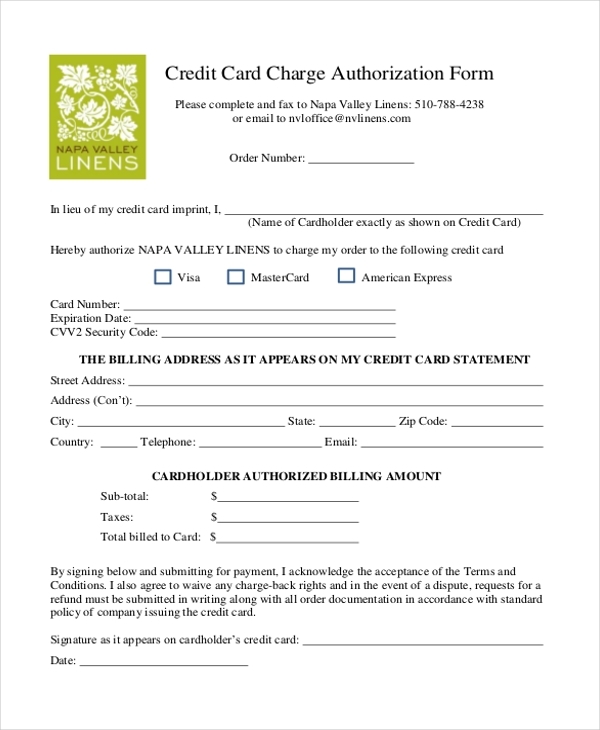 This credit card charge authorization form comes in a neat pdf format. It is one of the supreme examples of what such an authorization form should be and what it should look like. There are specialised credit cards for a single transaction. This document comes in a pdf format and follows the accurate pattern of such a document. Also, it maintains a formal tone throughout. 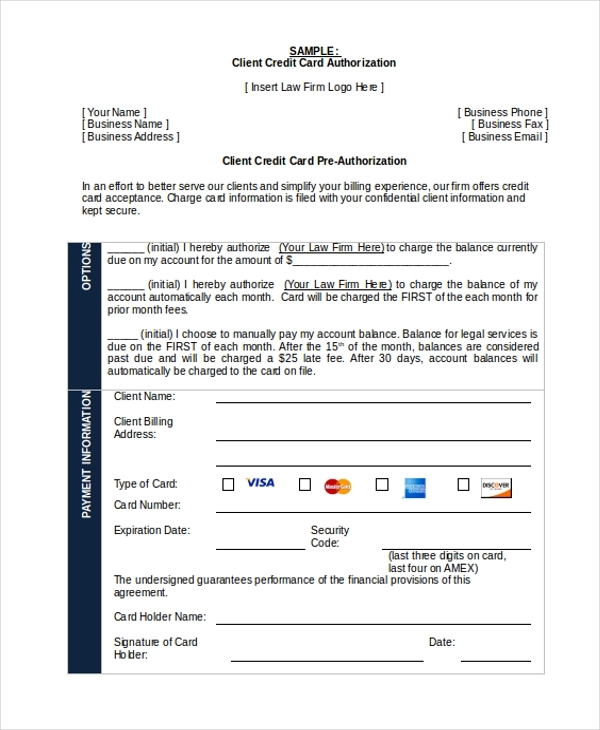 This template is the perfect example of what a third party credit card authorization form should look like. It can guide you with the details and even help you with the pattern or the format. 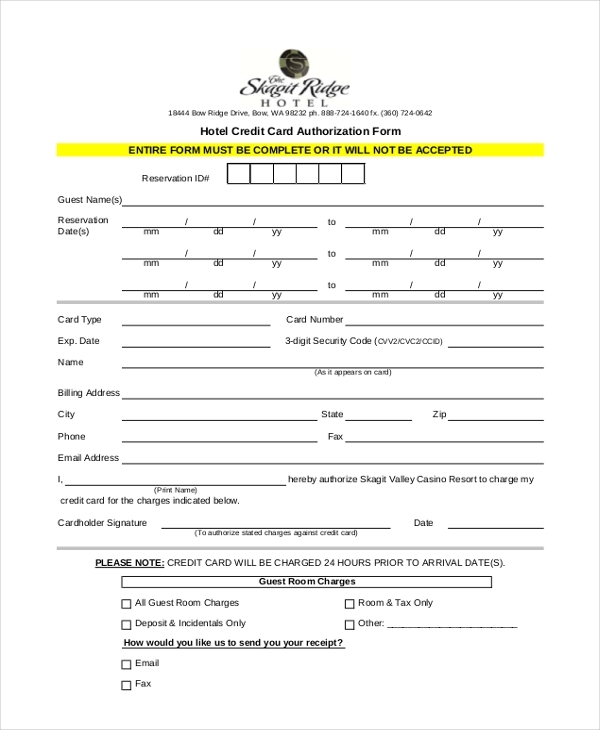 This template is dedicated to a hotel credit card and comes in a pdf format. This form allows you to organise the details in the proper manner as well. This client credit card authorization comes in a word document. That means the document here is 100 % editable and customizable. It comes with customization options which make your job easier. 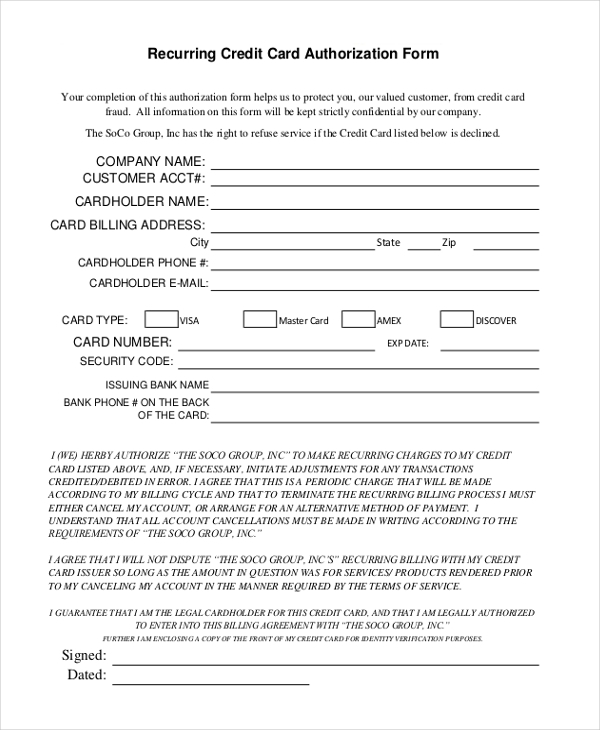 This credit card authorization form is dedicated towards the customers or the credit card holders. It comes in a pdf format and would be the perfect sample to model your authorization forms. 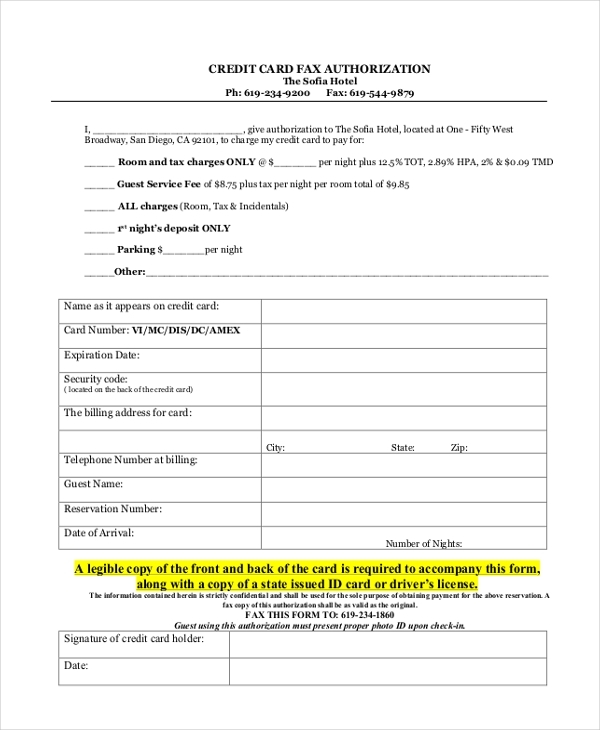 If you are planning to send a fax on the credit card authorization form, then you could easily take the help of this sample template. It comes in a neat and well-designed pdf format. 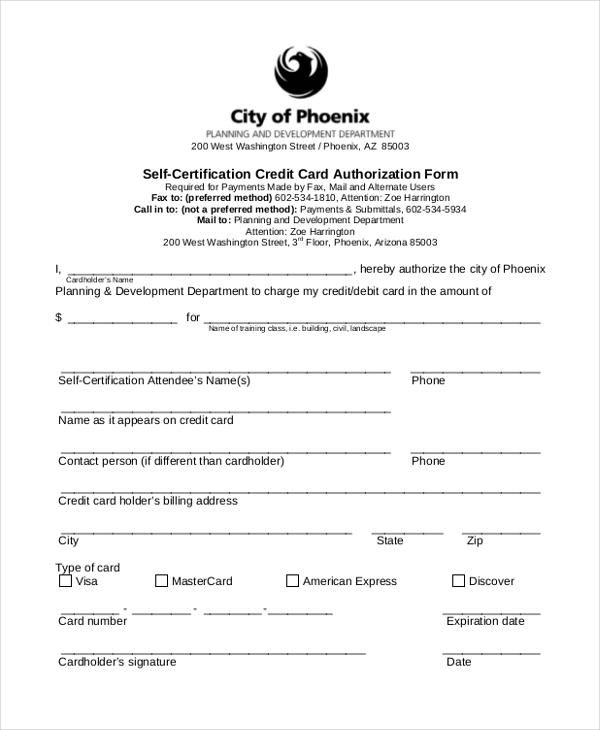 Who Can Use these Credit Card Authorisation Forms? 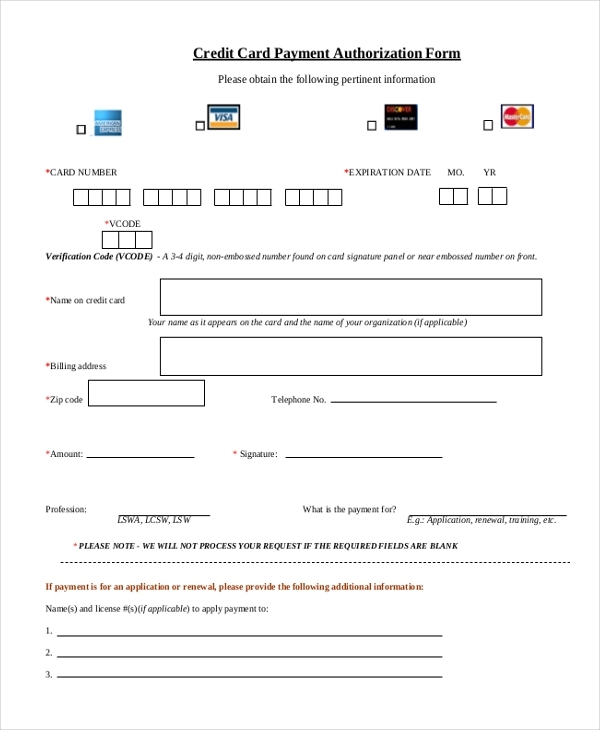 The credit card authorization forms that you see here are mainly directed at people who want to apply for a new credit card at their bank. To make sure that the credit card authorization form is accepted and approved, the cardholder have to make an appeal to the manager of the bank stating his request. The card authorization forms are mainly used by the banks who offer credit card services to their customers. While most banks usually have the same requirement when it comes to the credit card authorization forms, minute details may vary from bank to bank. You may also see Medical Authorization Forms. Credit card authorization is usually an elaborate and prolonged process. The form templates that you see here would make your job countless times easier for you as it would save on both time and energy. The forms here would serve as a perfect example of what such documents contain. 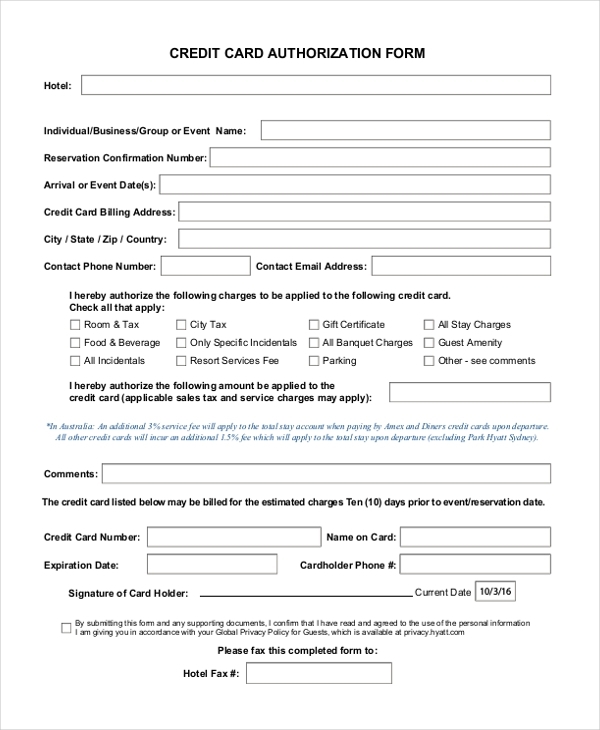 If you have never seen an authorization form before, you can take a look at these credit card authorization form templates here to get an idea of what they actually entail. There are various kinds of authorization forms here at your disposal, including travel authorization forms. Based on your purpose and your requirements, you can download the forms of your choice. The best part is these templates come in easy to use pdf formats and are quite simple in terms of usage. You can also see Travel Authorization Forms.